What It’s About: During the closing days of the Second World War, a National Guard infantry company is ordered to move into a town that could be occupied by Nazi forces. Earlier in the day their cowardly, politically connected commander Captain Cooney (Eddie Albert) failed to back up an assault, costing men their lives. When Cooney sends his most vociferous critic, Lt. Joe Costa (Jack Palance) in the vanguard of the assault, Costa swears that he will return to kill Cooney if Cooney’s timidity cost his men their lives. Why Watch it Today? 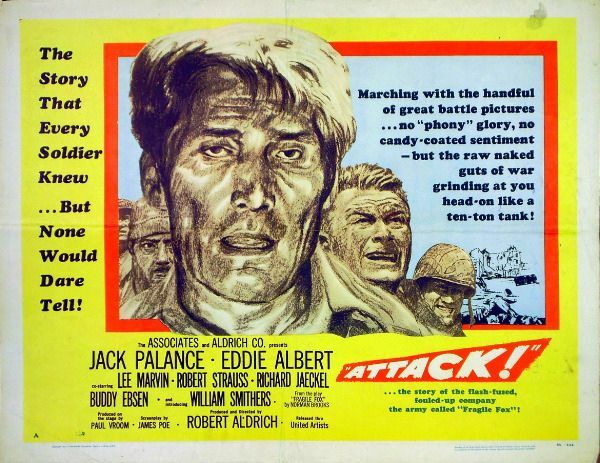 : Attack is an early film from director Robert Aldrich, who was born on this date in 1918. Aldrich uses his fantastic cast of character actors to bring a cynical eye to that most golden of sacred cows, the American military and its performance in the European theater during the Second World War. This entry was posted in Adaptation, Based on a Play, Black and White, Drama, Independent, Movie of the Day, Period Film, War Movies and tagged before they were famous, Buddy Ebsen, coward, double cross, Eddie Albert, Frank De Vol, incompetent officers, Jack Palance, Lee Marvin, low-budget, National Guard, Nazis, revenge, Richard Jaeckel, Robert Aldrich, Robert Strauss, Strother Martin, tank, United Artists, World War Two. It’s a wonderful flick that really deserves to be seen/talked about more.